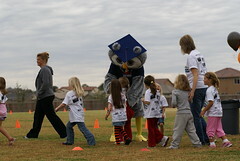 When organizing a walkathon you will be well served by good online fundraising and organizing software. I’ve been scouring the web for the best online fundraising tools. I still have more research to do. However I’d like to tell you about a few options in the mean time, in case you are already deep into your walkathon planning. This is worth doing because of time savings in collecting pledges, and also may well increase your total fundraising income by making it easier for those who prefer paying online to writing checks. Whatever you choose, you’ll need a dedicated volunteer with strong technical aptitude, and time, to set up your system. As the walkathon chair you should not also handle the software unless you are very comfortable with online projects because this is a big job in itself. Instead let someone from the group be in charge of just online fundraising. 1. One of DoJiggy’s products, DoJiggy Pledge, is specifically designed for pledge driven events so that your walkers can build their own pages and then collect donations online. It has a whole set of features ideal for walkathons. It is reasonably priced. Also, DoJiggy has a great new resource page. It includes walkathon checklists and also a sample participation waiver. I played with DoJiggy and was impressed with how much was included and also the frequent follow up from the company. I haven’t used it for an actual event so would appreciate comments from you if you have. 2. Here is a useful article that gives you a good start in looking at other technology options; “A Few Good Tools for Online Distributed Fundraising” by Stella Hernandez from Idealware, March 24, 2009. She covers about a dozen options and gives a framework for choosing. 3. Finally, if your group is doing more than just a walkathon and online fundraising, and needs more generalized tools for group communication and organization, you might want to try the groupery. It’s free. They give you a nice online community building platform and also a supportive group for leaders of active volunteer organizations. It collects payments from group members, and organizes volunteer shifts, and has a host of other features. I used to work there. They are very dedicated to making you successful. To make money? If so, how much? If you average that amount out per person, is it a reasonable expectation, or do you need to augment the event via sponsorships, concessions, recycling, a raffle, a silent auction, or other money raising efforts? To build community? If so, what fun ideas can you implement to encourage lots of interaction between people? For health awareness and exercise? If so, how can you give positive reinforcement for the walkers’ efforts? To gain public awareness for your cause? If so, what will you do to draw the maximum amount of attention to your walkathon and the reason you walk? Brainstorm a bit. Is there anything else you want to be sure to achieve? 1. Walkathon participants agree this is a worthwhile need. 2. The organizations leadership agrees this is a priority item for funding. 3. The items are very concrete, and can be purchased, put to use, and then publicized within a few months. This is great if you plan to do another walkathon the following year. 4. There are options for purchasing more or less, or finding partial financing elsewhere, depending upon the amount you end up raising. For example, If you opt for your school library as your cause, you can purchase much needed seating first, then use remaining funds for books. It also works fine to have two causes, such as “site beautification” and “technology center” to give you plenty of wiggle room. Over the years, your communiy will see the cumulative effects of their walkathons as the organization spends the funds on a growing collection of visible results! Looking for another article useful for early stage planning? Try this: “Start Now for Next Year”. Learn more about our easy, quick, inexpensive website for walkathons. Have you decided to plan a walkathon a season or two from now? Here’s a checklist for what to do to set the stage. 1. Get your core team: at least one leader and ideally two or three. 2. Pick your date and location and get them approved by the powers that be: local police and fire, the person who manages the location, your principal and PTA (or PTO) Board if you’re a school. 3. If this is a community wide event, present the idea to your town council to keep them informed and gain their support. 4. Inform people who will be affected, such as sports leagues who play during that time, so they can plan for busy players. 5. If you are planning this walkathon for your children’s school, schedule two or three planning sessions over the coming month. Ask your principal to start thinking about a very specific, visible item(s) the money will buy (such as playground equipment). I recommend that you continue to read the next article, a detailed list of key volunteer positions. They are an easy way to socialize. A lot of people (like me) find it easier to make friends while they are moving. The conversation comes more naturally than at a party. They are healthy. Everyone gets out and moves. They are fun. It’s basically a big theme party out doors. They appeal to all ages. There’s plenty to do for children, and the calmer set can sit and watch the walkers go by. They can be a catalyst for a lot of publicity for your cause. They can be very lucrative. Yes, it’s a lot of work. However, a Walkathon can bring in good money and at the same time, provide a friendly, healthy, and fun event for your community. I say plan well, but go for it!